Hello everybody, this week the themes for my post are: privacy and cybercrime. In the following lines you will find the best resources of the week on these subjects. Last Sunday I was at the Global Forum 2012 in Stockholm to present the importance of cyber-security for the economic growth (here is my presentation), so I haven't been able to publish my usual selection of the best security resources of the week. Since last week I had found some interesting materials, this week you will find items also from the previous list. 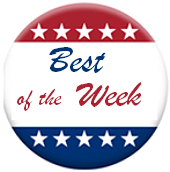 To me, Sunday is not Sunday without my "Best of the Week" post in which I publish the most valuable security resources I found during the week. This week I selected for you: papers, articles and security news.